Capture the beauty of your wedding flowers by having them professionally freeze dried and framed in a 3 dimensional shadow box. Preserving your flowers is a beautiful way to keep your wedding day memories alive and your bouquet will retain its natural beauty for years to come. 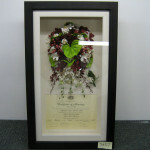 We also offer a 3 dimensional boxed frame of your choice featuring freeze-dried flowers from your wedding bouquet set around the marriage certificate and your wedding photographs. Flower preservation is also available for funeral flowers. Allow us to preserve a selection of flowers from the casket spray to keep in memory of your loved one. We also can preserve some sentimentally special flowers and display them under glass in a 3 dimensional boxed frame of your choice or set them around a photograph.